Flip Real Estate Using QuickBooks is a hands-on, get-it-done manual complete with step-by-step instructions, screen shots customized reports, industry specific chart of accounts and everything else you need to turn your real estate flipping business into a thriving, automated, revenue-generating machine. This simplified accounting solution will transform your risky real estate flipping business into one that is thriving and built to deliver AMAZING profits at every flip – consistently and predictably. Having this information at your fingertips will help you grow your business and will show you the exact steps you need to take to move your business to the next level. 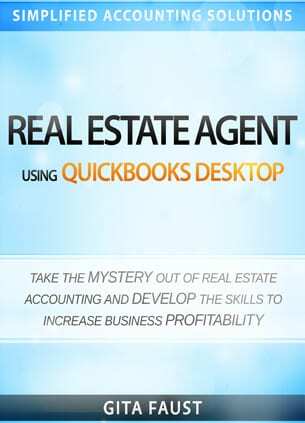 Discover the REAL Secret to Using QuickBooks to Track the Income and Expenses of Your Buy-Rehab-Resell Real Estate Investing Business! 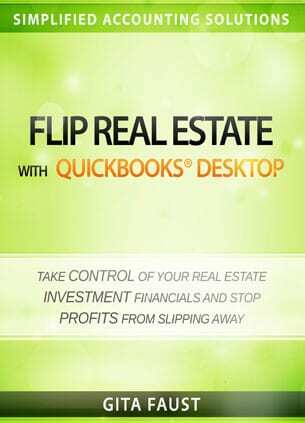 Flip Real Estate with QuickBooks Desktop is a hands-on, get-it-done manual complete with step-by-step instructions, screen shots customized reports, industry specific chart of accounts and everything else you need to turn your real estate flipping business into a thriving, automated, revenue-generating machine. 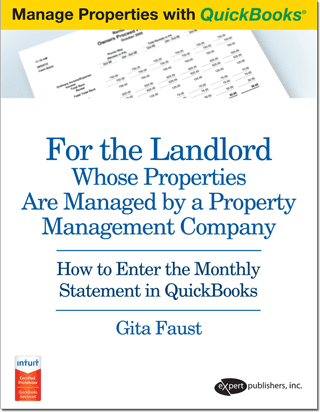 Gita Faust is a property landlord, as well as an experienced property flipper and Certified Advanced QuickBooks ProAdvisor. She’s been in the business a long time. When you purchase this manual, you’ll get the benefit of learning from her experience and knowledge and you won’t make the mistake of flipping a property without a proper budget and tracking of your expenses. Every task is explained in detail, with screenshots and step by step instructions. Even if you jump directly into the section without reading the book straight through, you will understand the how-to steps teaching you accounting for rehab. This manual covers the entire process of buying, fixing-up, and reselling properties. It shows you everything you need to know about using QuickBooks to make money in your rehab business. You’ll be an expert, in no time, analyzing your property and accounting for lender costs, property expenses, selling expenses, and tax consequences. Template QuickBooks file is compatible with QuickBooks Desktop Pro, Premier and Enterprise current version & prior two years (need a current version of QuickBooks? Call 866-645-3356). This step-by-step textbook manual teaches you everything you need to know to effectively and efficiently build your wealth, one flip at a time. This manual is designed for QuickBooks users of all levels: basic, intermediate and advanced users. Some readers may have more experience, and others may be using QuickBooks for the first time. Whichever category you fall into, we recommend that you read each chapter even though you may believe that you can skip one. This is because many chapters are interrelated and include specific instructions, which build on one another. To start, you will learn how to copy the template file, as well as backup and restore files. Upon opening our custom designed template, you will enter basic information about your Company and begin to apply best business practices. Before you dig into customizing your company’s file and using QuickBooks for your financial recording, you need to understand the basic layout and functions of the software. Although QuickBooks is user-friendly, becoming acquainted with its various functions will help you to improve the efficiency of your daily operations. 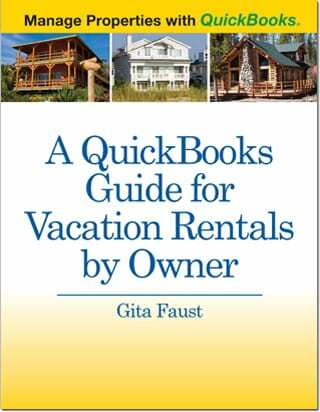 In the following chapters, we will explore both basic functions and special features of QuickBooks. You will see how easily adaptable the software is for managing your finances on a cash or accrual basis, and how it allows you to produce basic financial reports for your Company easily. You will learn how to use the time management tools within QuickBooks, as well as familiarize yourself with some basic and advanced transactions such as invoicing, reconciling, and deposits. To prepare for entering your information into the template file, gather all company information, including your tax ID number. Depending on your state, rent may be taxable, requiring you to file the appropriate sales tax and/or tax returns. These city and/or county returns are typically due monthly, quarterly, or annually. Once you have your Company’s information together, we will show you how to modify the template file and customize settings based on your business procedures. Having the correct settings and entering data and transactions appropriately produces accurate reports. Now that you have learned the basic layout of QuickBooks, and have restored your Company’s file. You will learn to enter equity owners, financiers, properties, and vendors. By adding and organizing these players correctly in QuickBooks, you will be able to record transactions and evaluate your business through specific reporting. To understand this better, let’s say you are a contractor. You have several customers, and for each customer, you have multiple jobs. Similarly, we are using Customer and Job to mean where each player fits in the puzzle. Entering balances is the first step to accurate financials, giving you access to accurate reports in QuickBooks. You will have your financial information on demand, rather than guessing or attempting to combine multiple Excel sheets and/or paper reports. Additionally, tracking a budget and forecast for each property and your Company is crucial to the growth of your business. Add the balances for all unsold properties to record the current value of the property and associated costs. Before you begin entering opening balances and property values, compile the information about your business operations and properties in one place. When you begin with a new file, it is very important that you enter all the opening balances the day before your start date. For example, if you are going to start entering data from July 14th, then your balances should be entered on July 13th. It is very important you follow the steps in order. Ready, Set, and Go. Learn to estimate costs and profits to decide whether or not to purchase a lead. If you need to put a deposit on a property, record it so you can track the refund if the purchase does not occur. If you decide to purchase the property, learn everything that you have to do when closing from applying the deposit toward your purchase to settlement checks, HUD-1 settlement sheets, and the closing statement for your company’s books. This section details every step of tracking and receiving payments. Learn how to create an invoice and record payments for money owed to you or how to generate a sales receipt to track money instantly received. If the customer overpaid, learn how to issue a refund, apply it to their account, or hold onto the extra money for a future transaction. If you receive a check that bounces, record it and reinvoice the transaction. Then collect the money by sending emails and monthly statements. You may hire employees or subcontractors to do work or provide services. Track their job, and either pay them by time or by task completed. Orders can be used for the purchase of supplies, to keep track of maintenance, or for noting repairs expected to occur. Enter an order to track supplies and/or avoid overpaying a supplier. When you decide to rehab or repair, complete an order to track the need and finally completion of the work. Track orders by a property. If you have a similar problem later, you will know when the problem was reported, the date of the original repair, and who did the work. Also, track whether you provided proper notice and/or received permission to enter the unit. As money comes in, it also goes out! Your business is likely to split between managing properties and vendors. As you purchase goods, supplies, and services from insurance companies, contractors, utility companies, and other suppliers, track these products and services, bills, and payments. The following chapters will show you how to track every interaction with vendors from deposits at the beginning of a job to credits after paying for completed work. We will cover how to enter and pay bills, either online or by using a credit card, petty cash, or your checking account. As a business owner, you will most likely find your Company in the position of borrowing or invest money at some point. The source of these funds may be an equity holder or a lending institution. Account for all loans to make sure your Company does not miss any payments. Soft money is any money that is loaned to your business by private investors or a partner of the enterprise. You will learn how to track such investments, pay off the principle and interest, and reinvest the interest back into your business. Then learn the procedure for tracking to and from the company’s partners. Hard money is any money that is loaned to your business by a bank or lending institution. You can track your loans and escrows by recording bills or checks. You will learn the difference procedures construction loans, line of credit, loans, mortgages and refinancing, and how to track them. Account for all loans to make sure your company does not miss a payment. Finally, if you refinance your loans, update your QuickBooks file, so you have all the current information. As a real estate investor, you buy and sell a property. When this occurs, you will need to record values from the HUD-1 Settlement Statement, create an invoice, and enter payments and deposits from the buyer. Then transfer costs from the property’s Balance Sheet to the Profit & Loss report to assess profitability. If applicable, divide profit between your investors and partners once it has been calculated and analyzed. Regular banking tasks, like writing checks, cross-checking your bank and credit card accounts with online statements, moving money from one account to another, and reconciling accounts, are valuable to your business if done properly. A simple mistake can quickly wreak havoc on your books. Learn how to perform these simple procedures the right way and do so regularly to easily manage your bank accounts and business. Section 13 It’s a No Brainer! There is always more to do than meets the eye. Performing miscellaneous and regular tasks will enable you to operate efficiently, put everything into action, and run a smooth and organized business! If you are stuck, please reach out and contact the author with any questions you may have. 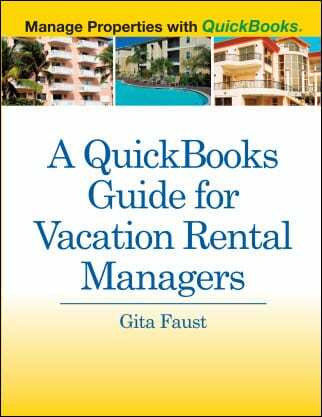 I used Gita’s QB property management system for many years after buying her book and doing a consulting call. I now also blog about real state and have a large following, so I’d like to refer my audience to some of your resources. Thanks! If you are looking for an accurate and efficient way to track investment property financials, this is the book for you. I love the fact that this book came with a CD that included a template of accounts and reports that are designed specifically for the real estate flipping business. This book walks you through the process step by step from initial profit projections to acquisition to rehab and resale. The memorized reports tailored for the flipping business provide instant access to make educated financial decisions. I would be lost without this book. The author, Gita Faust has also been instrumental in helping me through the rough spots. She has been there every time I needed help. Her knowledge of this business and how to translate that into QuickBooks is amazing. Thanks Gita! I would just like to thank you for your assistance and willingness to get me a expedited copy of your book. It came this morning. You have been extremely helpful and provided an amazing service. – Ashley Helfyre – Finance Manager, Residential Equity Partners, LLC.